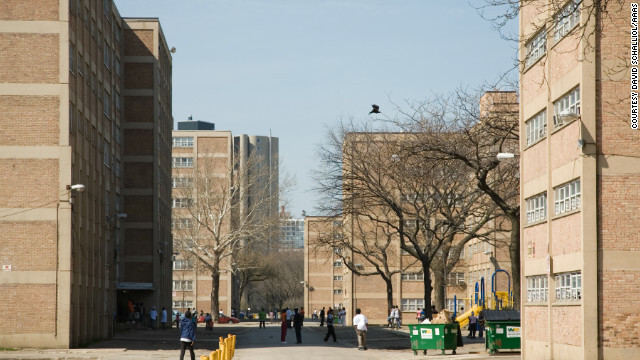 Much of Harold L. Ickes Homes, a public housing project in Chicago with high poverty concentration, has been demolished. There’s been a lot of talk about the growing income and wealth inequality in America, especially with the Occupy Wall Street movement. Solutions have yet to arise. Research published in the journal Science suggests that leaving a high-poverty area for one with less poverty concentration increases the well-being of the families who move. Of course, most people do not have this luxury, and more research needs to be done to determine how neighborhoods themselves can be improved. The U.S. Department of Housing and Urban Development spearheaded a program called Moving to Opportunity in the 1990s. Families in five cities in some of the most distressed housing projects in the country were randomly assigned to move via a lottery system. African-American and Hispanic females were most likely to be the leaders of the households in this study, and fewer than 40% of them had finished high school. The study took place in Baltimore, Boston, Chicago, Los Angeles and New York. Those selected to move received a housing voucher that enabled them to move to a less-disadvantaged neighborhood. More than 4,500 families living in public housing received vouchers. A research team followed up with the families 10 to 15 years later to see how changing neighborhoods made a difference in their lives. Moving to a less-disadvantaged neighborhood did not seem to affect schooling outcomes for children or earning outcomes for adults; it did not appear to influence employment or welfare receipt. But researchers did find improvements in the well-being of the families involved. In fact, the happiness improvements that the families reported would be the equivalent to the gains expected from a $13,000 increase in family income. Why is that? It’s hard to know what matters most for increasing well-being, said Jens Ludwig, lead study author and professor at the Harris School of Public Policy at the University of Chicago. Safety is probably part of the story, he said. At the beginning of the study, many families said that they wanted to move in order to get away from gangs or drugs. “MTO (Moving to Opportunity) thus impacted what the residents cared most about, rather than what policy-makers deemed most important,” writes Robert Sampson of Harvard University in an accompanying perspective on the study in Science. But note that only about half of families who could have used the voucher did so, partly because to move and secure an apartment in a neighborhood with less poverty proved to be problematic, Sampson points out. And some moved to neighborhoods on the downswing already, or back to impoverished neighborhoods. Study authors noted that racial segregation is on the decline, but income segregation has been increasing - and it's the latter that's related to well-being. An important potential lesson is to learn more about what features of neighborhoods could be changed to improve residents’ well-being without having to move anyone, Ludwig said. “It’s hard to imagine the federal government enacting some sort of policy that will move millions of families,” he noted. Safety upgrades such as putting more police officers on neighborhood streets may make a difference, and improving the quality of local schools can reduce crime, too. But with budgets as tight as they are in many cities, such efforts are challenging. Prior research suggested that the families in the Moving to Opportunity study who had moved were less likely to have problems with extreme obesity and diabetes. “Durable neighborhood inequality sharply influences individual housing choice and thus neighborhood-level change, but it remains unclear whether people-based or place-based interventions will be more effective in confronting persistent spatial divisions by race and class,” Sampson wrote. There was a study to show that non obese people tended to gain weight around obese people....almost like fat is contagious. I had a freind who moved up north and she said they used to say that it was the water, everyone was getting fat. Perhaps it's like that in the housing complexes....notice everyone is fat. No one is going to take up walking or exercising when the rest are sitting around visiting, drinking and eating. You join them doing nothing. Get them away from that group and they might change with another set of people. The only thing that needs to be moved is the thinking of the people that live in these neighborhoods. They really have a ghetto thinking mind and that's what tears the neighborhood up in the first place. Like the old saying. You can take the person out of the ghetto but you can't take the ghetto out of the person. It follows wherever they go and wherever they go – they tear up. No respect for where they live. No respect for who they are. It's Terrible! Use301, How many of these people have your talked with to know they have 'ghetto thinking minds', and how do you define ghetto thinking minds. You sound like Mitt Romney, totally out of touch with the real world. John – You aren't presenting a counter-point to User's argument, you are just attacking Mitt Romney. There is a great deal of truth to what User says. The individual has the ability to change the environment in a positive way if he or she so desires. Granted, they may still live in poverty, but they don't have to tolerate the crime and drugs rampant in the neighborhood. Isn't that what community organizing is about? Motivating the people to help themselves and solve their problems? Doesn't seem like Obama is very good at what he did before he became a Senator. If he was, maybe he would be able to inspire individuals to find solutions themselves instead of looking for the government for assistance. Sometimes things are just wrong and it costs way more to fix them than to move people elsewhere. Why can't the government just accept that, move out those that will go, and then work to decrease the size of the blighted area remaining? Well being is enough reason to move people. A study comparing the well being of the next generation would be very useful. I do believe that you adopt the habits and lifestyle of your surroundings. I think that moving to a neighborhood that is more active and educated will tend to motivate you. Not everyone who lives in these economically depressed neighborhoods or "ghettos" is there because they want to. Some cities don't have many options when it comes to affordable housing and apartments to rent. Couple the overcrowding of some of these areas with lack of employment and services and people get depressed. Moving to someplace new brings people out of the rut that their stuck in even if just for a little while. If I got a housing voucher for a nice neighborhood and still got welfare, food stamps, etc. I'd be pretty happy too! What a dumb study. Here in CA they can use their Section 8 housing anywhere a landlord will take it. So while the family may be "happier" but no better educated or more employable, the rest of the neighborhood is not so happy with the kids running loose causing problems, the junk cars in front of the house, the unkempt yard and ultimately, their property values being driven down in the neighborhood they had to work hard to buy into. And what about the happiness of the regular people who had to have ghettoized people move in next to them? I am happy that they are happy. Meanwhile, a working middle class family can't afford the same apartment because the government assistance is interfering with the market price. Manhattan has become the playground of the ultra rich, paying millions for a 2 bedroom apartment and the non-working poor, paying next to nothing and getting government assistance. Woah this blog is fantastic i like studying your posts. Keep up the good paintings! You realize, a lot of people are hunting round for this info, you could help them greatly.